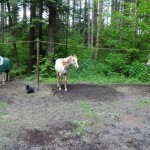 Here’s a great update from Miah’s adopter, Heather! Hi everyone, happy spring, Finally! Miah has been with me now for about 6 months. We did little during the winter except survive, although that time was well spent, Miah is home and I think she knows that. I was able to take her out in April when we had a few good weather days that just happened to coincide with my days off and was quite surprised, she was a willing trail partner with no fuss or issues. She was a lot calmer and just seemed to be more comfortable with life and her surroundings. 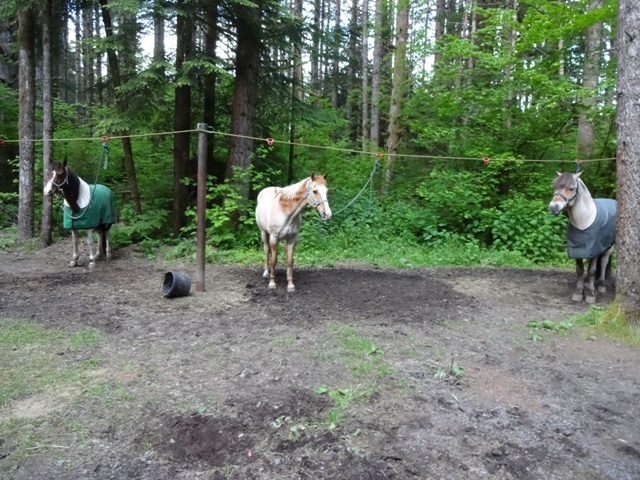 This last Thursday we loaded the camper, the horse trailer, all the horses and went to Sahara Creek Campground near Elbe for 4 days and 3 nights. 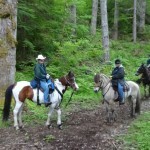 If you are not familiar with the horse camp or the trails here is a link: http://trailmeister.com/elbe-hills-sahara-creek-campground-wa/ I have also attached a terrain map. The camp ground is well maintained with high‐lines, water, and toilets. I had worked with Miah at home on a high‐line so was confident she would be ok. She did great, no issues on the high‐line; training goal number 1‐pass. 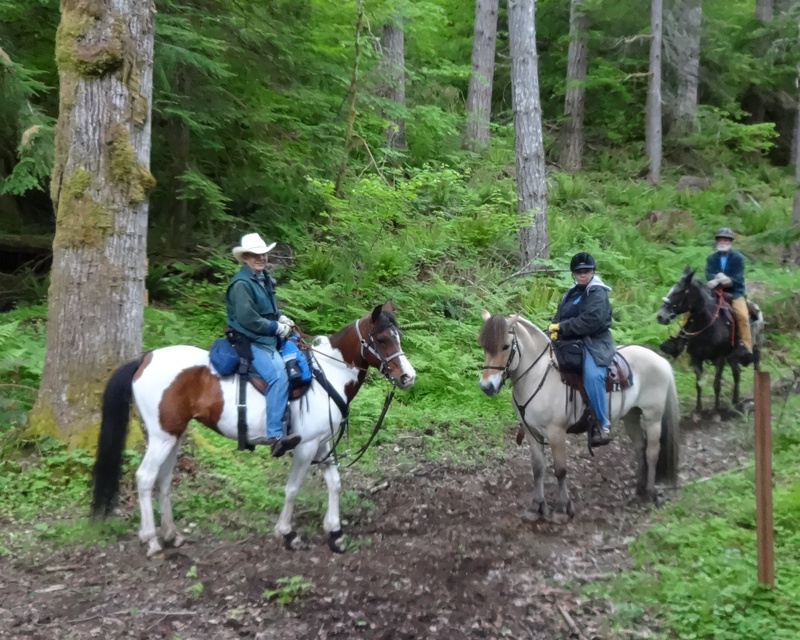 After camp was set up we saddled up and went for our first ride on the Nicholson Horse Trail. 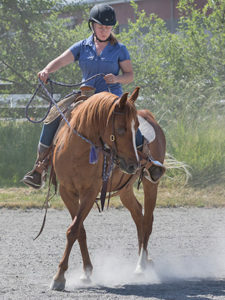 We decided to do the shorter Does Crossing loop since the elevation change from Lower Elk Spur to Upper Elk Spur can be significant especially for horses that are not yet in shape. Miah’s first challenge was a bridge, she only hesitated a little but followed Gus across with no problem. The next challenge was the Steps, this is the first climb and is a steep zig‐zag with water bar steps, she took the climb like a champ, next was the gun fire from the rock quarry above the trail system, not a flinch out of her. The next challenge was a creek with boardwalk step‐downs to the creek. Here we had some issues since Gus decided He didn’t want to go down the boardwalk to cross the creek. I asked Miah to take the lead, she went down the first two step‐downs ok, then started having second thoughts. About half way down she stopped, gentle encouragement was not working and she seemed to be escalating. The footing situation is not one you want a horse getting nervous and dancing around on so I got off and started leading her. I had to get my feet wet crossing the creek but she followed me across. Gus on the other had was not having anything to do with it until he thought Miah was going to leave him, amazing how fast and willing he was crossing the creek then! The rest of the ride was uphill, downhill, beautiful terrain and trails, some logs and roots to step over, step downs and another bridge. Miah’s attitude and willingness was admirable. 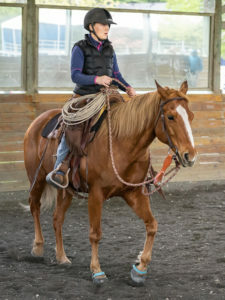 She finished that ride in good shape with no soreness at all. The next two days was more of the same but in different configurations, directions, levels of difficulty, and challenges. There are two creeks on Lower Elk Spur that are close to each other, these happen to be year‐long creeks and this time of year they are roaring loud with snow melt run‐off. Now even though these creeks are not very wide, they seem to be the most horse eatin’est creeks ever to be presented to our dainty little mare! It took a little time but she went across without my feet getting wet, a definate plus! 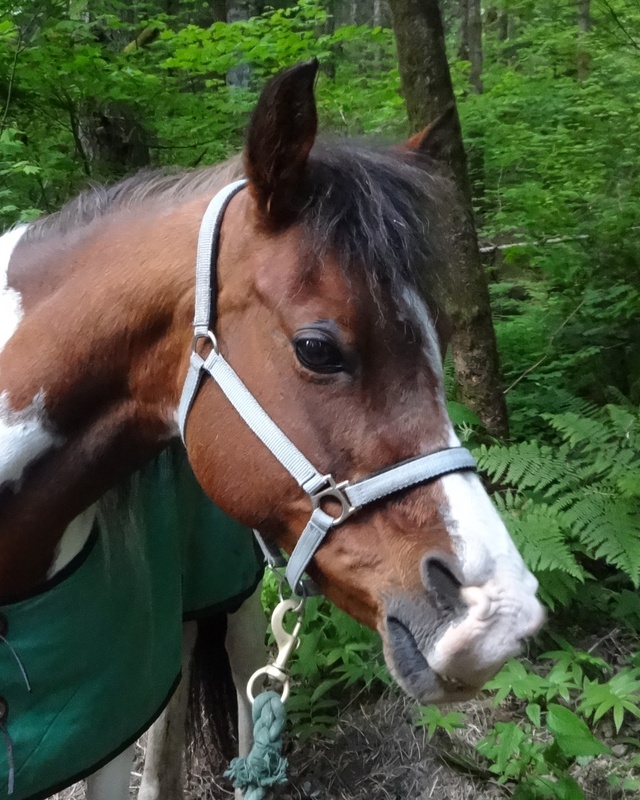 Miah rode three days in a row, climbed a lot of hills, rode in the rain, stood on a high‐line for three nights all without a serious bout of fear or unwillingness (she didn’t even snort!). I checked her after every ride and she was not sore or lame. She passed all the challenges presented to her this week with flying colors. 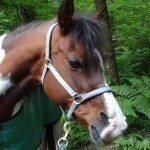 Ms Miah is officially a trail horse! 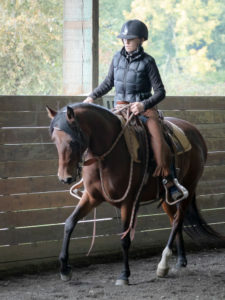 Now time and miles will get her strong and the more she encounters the more confidence she will have. yay Miah! I know those trails well and that was quite a first trip out!!! Thanks for such a fascinating article, happy to hear Miah is doing so well!